Make your space a reflection of the unique individual you are. Whether you identify with a deeply motivational thought, a beautiful embellishment, a bold image, or a combination of these, Uppercase Living® expressions let you be who you are and let you express that uniqueness in your surroundings. We call this the art of self expression. Home & Family... Welcome guests to your home without saying a word. Even the simplest expression or design can turn your favorite place on earth into an inviting haven for all who enter. Outside the home.... Get creative outside the home, with chic designs for a number of places and outdoor spaces. Whether you're celebrating a special family moment or assisting clients, it's easy to express your one-of-a-kind style. Inspiring... Surround yourself and your loved ones with expressions that uplift and inspire. Every quote, scripture, or image your display can be a subtle reminder to cherish the people, places, and moments that matter most. Embellishments... Your next party is sure to be a hit with an assortment of stylish embellishments that set the stage for fun. Use these simple and affordable visuals to create the perfect mood for your gathering or to add the finishing touch to any design. This is so neat. Is the 'check your pockets' on the washing machine part of it? That is SO cute. I LOVE Uppercase Living! I have the "Check Your Pockets"; "Always Remember to Kiss Me Goodnight" "As For Me & My House We Will Serve the Lord" and sooooo many more!!! The one I love the best is the one my husband had customized for his motorcycle. It says "I Ride For Him Because He Died For Me". It is very easy to install not only on your walls, but on your vehicles, as well! I've had the name of my Cleaning business on my van for over 3 years, and it still looks just as good as the day I put it on because of the awesome vinyl UL uses. I have been looking for a special one.. about "Moments"... was on my friends wall... I'll keep looking! 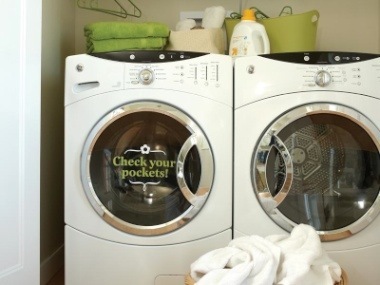 Yeah, the "Check Your Pockets" is on the washing machine. Isn't that so adorable. I want it! Love this stuff!! I shared a blog award with you! Pop over and get it. Right now we are running a great incentive of Buy 2 get 1 FREE!